The Google Wonders Project is an interactive website that allows visitors to discover many of the wonders of the world. Virtual visitors can get off the beaten path and explore wonders from 6 continents up close through Google’s amazing street view technology. Virtual visitors can find factual information, stunning images, 3-D models and YouTube videos right on the page, which makes the World Wonders Project an amazing teaching tool. The newest addition to the collection takes visitors on an underwater tour of the Great Barrier Reef. Divers used the world’s first tablet-operated underwater camera to capture high-definition panoramic images of the reef to create stunning content. The underwater expedition is part of a larger scientific study which aims to help bridge the gap between scientific awareness and public knowledge. Google has partnered with The Catlin Seaview Survey for a major study of the world’s reefs and has made images from from coral reefs in Australia, the Philippines and Hawaii available through Google Maps. There will also be a dedicated YouTube channel for project-related videos. It’s probably only a matter of time until Google assembles more packages of teacher-friendly content from the underwater expeditions and makes them available through the Google Wonders project. Students today have had easy access to a tremendous amount of multimedia content for their entire lives and it’s fairly safe to say that they can be careless about using it. When asked to create multimedia projects for school, many students simply search topics and use whatever they can find without giving much thought to copyright unless it has been addressed and reinforced by their teachers. It’s never too early to start teaching students about copyright, fair use and Creative Commons. Spin Xpress is a website that allows people to collaborate and share media. One of the features offered is a search engine that allows users to search for media by CC license type. After teaching students about CC licenses, this is a great tool for students. Embed it into your blog, wiki or website and provide students with quick and easy access to images that have CC licenses. 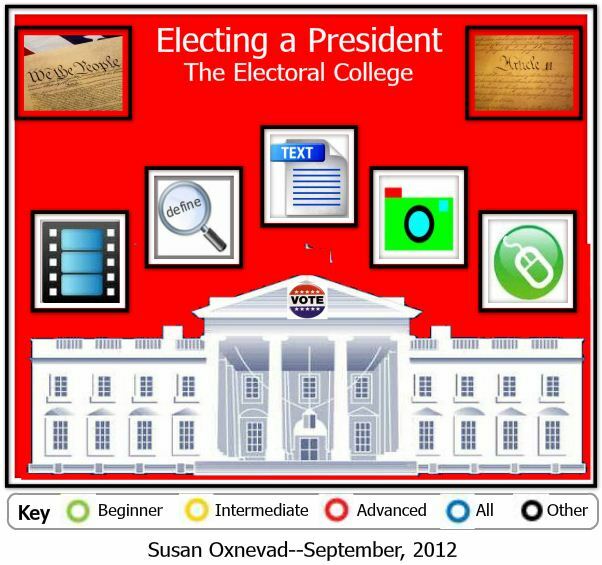 I created an interactive graphic to provide students and their teachers with flexible paths to learn about electing a president and the electoral college. The image was created with ThingLink. I used some of the new storytelling icons to identify different types of resources. Are you wondering where to begin to adopt the Common Core Vocabulary Standards? While there are many specific vocabulary standards clearly listed in the K-12 Language strand, it’s helpful and important to look at Academic Vocabulary from the big picture view known as Shift 6. Let’s unpack it. The Common Core suggests that it’s important to target specific instruction on Tier 2 and and Tier 3 vocabulary words to help students develop deep understanding that cannot be acquired through independent reading. Since Tier 3 words are typically targeted in content specific instruction, it’s particularly important and challenging to identify and target Tier 2 words, since they appear across all disciplines. The task at hand, then, appears to be identifying the Tier 2 words and finding effective instructional strategies to support acquisition of those words. It’s clear that identifying the Tier 2 Vocabulary words in a passage can be both challenging and time-consuming for teachers. While it is important for the teacher to be the decision-makers about identifying Tier 2 Vocabulary, and it’s understood that a digital tool is no substitute for human decision-making, it’s helpful to have a tool to jump start the process and provide a starting point. Wordle, a simple word cloud generator can be a handy tool for this task. Included in the collection of Common Core resources from EngageNY is a high school level exemplor lesson that devotes three days of instruction to carefully examining and interacting with the first three paragraphs of Lincoln’s Gettysburg Address. The focus of vocabulary instruction in this lesson centers around one important word, dedicated. I decided to pop the of text of The Gettysburg Address into Wordle to see if the tool would identify this important Tier 2 word and the results were consistent with the findings of EngageNY. The word dedicated jumped off the page along with some other significant words. Taking this one step further, I returned to the original text and used the Find Tool (control + f) to find occurances of the word, dedicated. This was helpful for jump starting the process of examining the important word and how it is used in context. I performed similar experiments on other significant documents, including Martin Luther King’s I Have a Dream speech. The tool does appear to be helpful as a starting point for identifying significant words, but again, it is no substitute for human decision-making. If you are looking for digital tools to help students build deep meaning of vocabulary words, there are quite a few that are well-suited for the task. I have created a MentorMob playlist of tools to guide the journey and exploration through some previous blog posts with more information about the tools.